I’m over at Word-Whores today, chatting a little bit about what it means to be a geek today vs the the past. Otherwise, there’s not much new going on except yay for cleaning the house.Not quite done, but it’s getting there in little bits and pieces. I’m enjoying my week of non-writing overall (except for some little bits here and there), but I’ll be getting back on the horse next week as the outline for BoD3 was approved yesterday. I’ve got about 20k or so already written on it, but the edits for SoS were sorta sucking up all my time. Besides, I wanted to make sure it was a go before I got too much further into it – it’s a bit heartbreaking to realize that I might have to undo all of that if the publisher decides they want changes. And the Legacy DLC for DA2? Mmmmm….so very, very nice. Particularly all the taints. 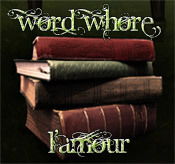 This entry was posted in blog and tagged da2, taint, updates, word-whores. Bookmark the permalink.